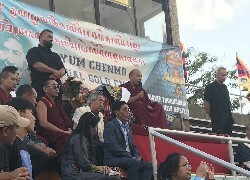 DHARAMSHALA, Sep. 11: The Indian government has openly signaled that their arrangement for the ranking Tibetan Buddhist leader Karmapa Ogyen Trinley Dorje has changed significantly in the past few months. A top official from the Ministry of Home Affairs has said that the government is willing to further ease travel restrictions and dispel Indian intelligence notions that he may be a foreign agent. “We have no doubts about his commitment to the Tibetan civilisation struggle, his loyalty to His Holiness the Dalai Lama and his attachment to India,” Mathur said. The Indian official who has been the interlocutor between New Delhi and the Karmapa has said that the heavy scrutiny and suspicions towards the young Buddhist leader is a thing of the past. The Karmapa who has been in the United States for the past year for medical treatments has said that he may return to India in November to attend a meeting of religious heads. The 33-year-old Tibetan lama escaped to India in the year 2000 and has since been living near Dharamshala in Northern India under the protection and an “overly scrutinised watch” of the Indian government. Observers say that the Karmapa will eventually succeed the Tibetan leader His Holiness the Dalai Lama as the “natural” Buddhist leader and that India is trying to gain grounds in securing extended benefits of his influence and clout in the Buddhist community worldwide.